Synthetic peptide conjugated to KLH derived from within residues 450 to the C-terminus of Human HDAC2. WB: HAP1, HeLa, A431, Jurkat and HEK293 whole cell lysates and HeLa nuclear lysate. ICC/IF: HDAC2 wildtype cells. Our Abpromise guarantee covers the use of ab16032 in the following tested applications. WB Use a concentration of 0.5 µg/ml. Detects a band of approximately 60 kDa (predicted molecular weight: 55.3 kDa). Lanes 1 - 2: Merged signal (red and green). Green - ab16032 observed at 60 kDa. Red - loading control, ab18058, observed at 130 kDa. 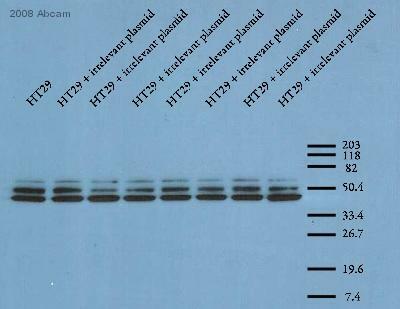 ab16032 detected the expected band for HDAC2 in wild-type HAP1 cells and the band was not seen in HDAC2 knockout HAP1 cells. Additional cross-reactive bands were detected. Wild-type and HDAC2 knockout samples were subjected to SDS-PAGE. Ab16032 and ab18058 (Mouse anti Vinculin loading control) were incubated overnight at 4°C at 1000 dilution and 1/10000 dilution respectively. Blots were developed with Goat anti-Rabbit IgG H&L (IRDye® 800CW) preabsorbed ab216773 and Goat anti-Mouse IgG H&L (IRDye® 680RD) preabsorbed ab216776 secondary antibodies at 1/10000 dilution for 1 hour at room temperature before imaging. ab16032 staining HDAC2 in wild-type HAP1 cells (top panel) and HDAC2 knockout HAP1 cells (bottom panel). The cells were fixed with 100% methanol (5min), permeabilized with 0.1% Triton X-100 for 5 minutes and then blocked with 1% BSA/10% normal goat serum/0.3M glycine in 0.1% PBS-Tween for 1h. The cells were then incubated with ab16032 at 0.5μg/ml and ab195889 at 1/250 dilution (shown in pseudocolour red) overnight at +4°C, followed by a further incubation at room temperature for 1h with a goat secondary antibody to Rabbit IgG (Alexa Fluor® 488) (ab150081) at 2 μg/ml (shown in green). Nuclear DNA was labelled in blue with DAPI. Immunohistochemistry - Free Floating - Anti-HDAC2 antibody (ab16032)Image from Takase, Kenkichi et al. PLoS ONE 8.3 (2013): e58473. doi: 10.1371/journal.pone.0058473. Fig 1N. 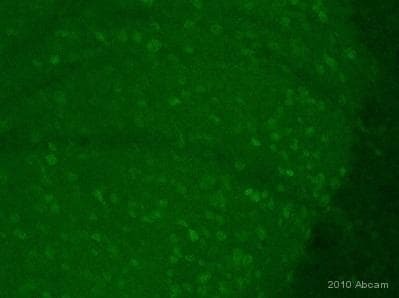 Immunohistochemistry - Free Floating analysis of mouse brain labelling HDAC2 with ab16032 at 1/250 dilution. HDAC2 was detected in the nuclei (arrows) of dopamine neurons, neuronal marker (magenta) and Hoechst stain (blue). Brains were post-fixed overnight in phosphate-buffered 4% PFA, and equilibrated in 30% sucrose for 2 days. Brains were sectioned on a cryostat at 30 µm. Sections were stored in a cryoprotective tissue collection solution (25% glycerol, 30% ethylene glycol, 0.05 M phosphate buffer (PB)) at −20°C until use. Immunofluorescence was performed using a free-floating method. Immunohistochemistry - Free Floating - Anti-HDAC2 antibody (ab16032)Image from Takase, Kenkichi et al. PLoS ONE 8.3 (2013): e58473. doi: 10.1371/journal.pone.0058473. Fig 1M. Immunohistochemistry - Free Floating analysis of mouse brain labelling HDAC2 with ab16032 at 1/250 dilution. HDAC2 was detected in the nuclei (arrows) of histamine neurons, neuronal marker (magenta) and Hoechst stain (blue). 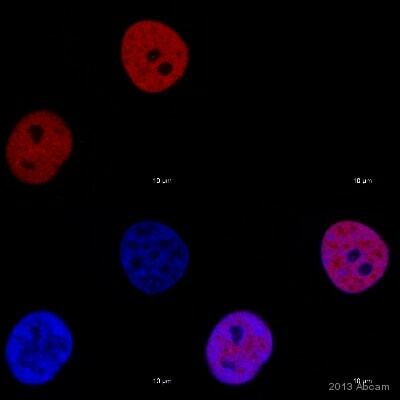 ICC/IF image of ab16032 stained HeLa cells. The cells were 100% methanol fixed (5 min) then permeabilised using 0.1% PBS-Triton and then incubated in 1%BSA / 10% normal goat serum / 0.3M glycine in 0.1% PBS-Tween for 1h to further permeabilise the cells and block non-specific protein-protein interactions. 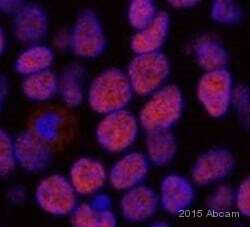 The cells were then incubated with the antibody ab16032 at 5µg/ml overnight at +4°C. The secondary antibody (pseudo-colored green) was Alexa Fluor® 488 goat anti- rabbit (ab150081) IgG (H+L) preadsorbed, used at a 1/1000 dilution for 1h. Alexa Fluor® 594 WGA was used to label plasma membranes (pseudo-colored red) at a 1/200 dilution for 1h at room temperature. DAPI was used to stain the cell nuclei (pseudo-colored blue) at a concentration of 1.43µM for 1hour at room temperature. 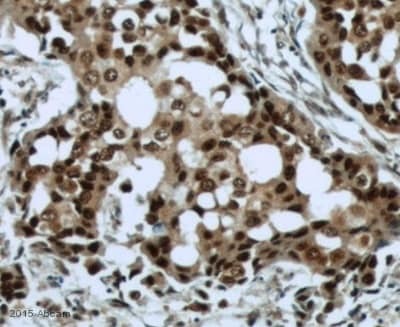 HDAC2 was immunoprecipitated using 0.5mg Hela whole cell extract, 5ug of Rabbit polyclonal to HDAC2 and 50µl of protein G magnetic beads (lane 1). The antibody was incubated with the Protein G beads for 10min under agitation. No antibody was added to the control (lane 2). Hela whole cell extractdiluted in RIPA buffer was added to each sample and incubated for 10min under agitation. Proteins were eluted by addition of 40µl SDS loading buffer and incubated for 10min at 70oC; 10µl of each sample was separated on a SDS PAGE gel, transferred to a nitrocellulose membrane, blocked with 5% BSA and probed with ab16032. Secondary: Mouse monoclonal [SB62a] Secondary Antibody to Rabbit IgG light chain (HRP) (ab99697). Band: 60ka: HDAC2. Immunohistochemistry (Formalin/PFA-fixed paraffin-embedded sections) - Anti-HDAC2 antibody (ab16032)This image is courtesy of an abreview submitted by Antibody Solutions Ltd.
ab16032 (1/250) staining HDAC2 in paraffin-embedded Human tonsil tissue. Tissue underwent fixation in formaldehyde, peroxidase blocking, protein blocking and heat mediated antigen retrieval. 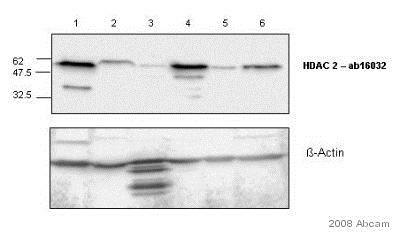 The secondary antibody was goat anti rabbit/mouse conjugated to HRP. For further experimental details please refer to abreview. 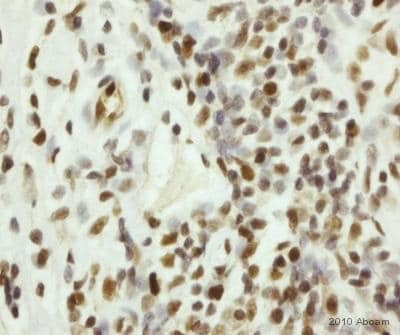 Immunohistochemistry (Frozen sections) - Anti-HDAC2 antibody (ab16032)This image is courtesy of an anonymous abreview. 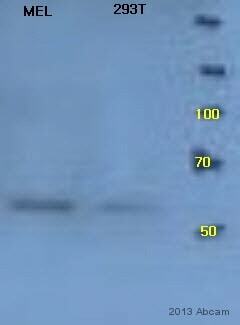 Lysates/proteins at 20 µg/ml per lane. Observed band size: 60 kDa why is the actual band size different from the predicted? ab16032 cross-reacts with Mouse 3T3 cells but shows no cross-reactivity against either Rat liver or Chicken cell lysates. Publishing research using ab16032? Please let us know so that we can cite the reference in this datasheet.